The Skinny: Insanely elaborate special effects highlight Tsui Hark's ambitious sequel to his classic Zu: Warriors from the Magic Mountain. The result, while bursting with eye candy, turns out to be a morass of uninvolving spectacle, murky plotting, and bizarre abstract concepts. The film's commercial failure marks an unfortunate setback for Tsui Hark and yet another box-office flop for the maligned Ekin Cheng. Tsui Hark returns to the well for this ambitious sequel to his seminal fantasy classic Zu: Warriors from the Magic Mountain. 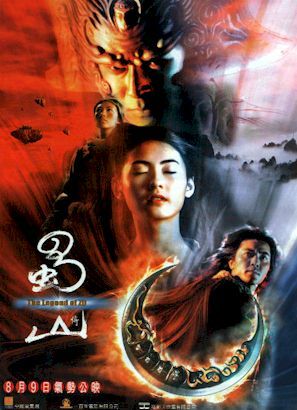 The Legend of Zu reinvents his fantasy saga with some of the same characters (Ekin Cheng and Cecilia Cheung sub for Adam Cheng and Brigitte Lin) but an all-new plot and new conflicts. This effort was co-funded by the Weinstein brothers of Dimension/Miramax fame, who walked away with exclusive North American distribution rights to the film. They also walked away with an unreleasable product, which will probably earn some "serves you right" tongue-wagging from the Hong Kong Cinema fan community. Ekin Cheng stars as King Sky, the sole remaining member of the Kun Lun clan. Two hundred years ago he lost his true love/martial arts teacher Dawn (Cecilia Cheung) when she got wasted by evil cloud/thing/force of nature Insomnia. Now Insomnia has returned, which means that everyone inhabiting the Zu Mountain range is in serious trouble. Figuring in is the O-Mei clan, led by White Brows (Sammo Hung). This particular clan houses the Heaven and Thunder Swords, which can merge together to form a spiky ball of yellow light that's reputed to be the most powerful weapon/thing ever. They need the spiky ball to combat Insomnia, but unfortunately the merging goes bad and Hollow, the Thunder Sword's owner, is lost. Thankfully, White Brows has a plan. He reincarnates Hollow into a wacky martial artist named Ying (Wu Jing), but he's still unenlightened. He needs the guidance of Heaven Sword mistress Enigma (Cecilia Cheung). King Sky hangs around to help out, but he's got one eye on Enigma, who's the reincarnation of his true love Dawn. White Brows needs King Sky too, because King Sky is the bearer of the "Power of Regeneration," which needs to be combined with the "Power of the Mind" and the "Power of the Universe" to create the Ming Sword, a spiky blue light club which is supposed to help defeat Insomnia. Meanwhile, top O-Mei disciple Red (Louis Koo) guards the Blood Cave, where Insomnia is hanging out. Add in Patrick Tam as one of O-Mei's followers and Zhang Ziyi as a commoner thrown into the middle of the mess, and you've got more people and stuff going on than you can possibly imagine. As if the above fantasy hokum wasn't enough, there's also stuff involving another bad guy named Amnesia (Kelly Lin), who takes the form of a red fairy who annoys Red. There's the saga of the Moon Orb, King Sky's sentient weapon which can somehow sniff out its former owner Dawn, now housed in Enigma's lovely form. And there's the audience, who must try to understand what the hell is going on while also contemplating a trip to the bathroom and the possible purchase of popcorn. Overstuffed doesn't even begin to describe The Legend of Zu, which possesses a patented Tsui Hark plot that's as confusing as it is rich in detail. The details themselves are bizarre abstract concepts that serve no purpose to a normal human being. The Moon Orb will someday lead King Sky to Dawn. The Ming Fire possesses the spirit of White Brows, and must never be extinguished. All O-Mei disciples must find their own sword, or will not be admitted into the clan. The Thunder Sword can only find a new master when its memory is erased in the Tri-Element Hall, which also houses the departed spirit of Dawn. And if King Sky eats the Ming Fire and gets stabbed by the Power of the Universe, he'll get the Ming Sword, and probably extra experience points and passage to battle the final boss. A question for the filmmakers: just what the hell is any of this supposed to mean? Tsui Hark never really lets us know. Every plot point is pulled out of some unknown ether (or perhaps Tsui Hark's backside) and thrown upon us as some sort of pseudo-religous gospel that everyone in the land of Zu understands. Unfortunately, the audience doesn't understand any of it, which is a bad thing. Tsui Hark pretty much assumes that we care, which is assuming way too much. Adding to the frustration is a total lack of character. The requisite popstars are pretty and pose mighty well, but they're hardly identifiable or even interesting. Presumably Zhang Ziyi's character could have offered some insight to the uninitiated, as she's a common warrior who somehow gets embroiled in this battle of heavenly gods. However, her character never really does anything, and remains a cipher to the audience. All she and the other characters do is run around, hit their marks, and say their lines, and that just adds to the unintelligible sensory overload that the film eventually becomes.